Matzrap Army Camp, October 2014: It’s 8:15, time to work. Breakfast and flag raising are over. The Henna Hannahs are already on the job. This is the name I have given to the seven or eight elderly ladies who have been bused in from a senior citizens home, the color of their hair belying the rest of their bodies. 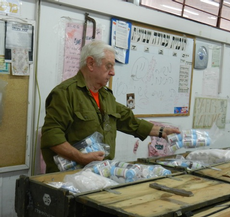 They sit at a table, shmoozing while they place various combinations of medical supplies in small plastic bags, which are then sealed and placed in containers going out to the troops. They work steadily till lunch, which they are given before being bused back to their home. This is their – and our – contribution to Israel’s welfare. We are 30 Sar-elniks, mostly Canadian, whose job it is to open containers, packs and medical vests coming back from the front. We empty them out, remove items that are no longer useable, replace the items and then repack everything. Containers are then sealed in plastic bags, put on pallets and shipped out. While they are replaced by more containers and the process repeats itself, there is a feeling of accomplishment every time a pallet leaves. On this tour of duty, we were helped by groups of young solders training to be medics. There were 18-year-old women and, later, men who were from an elite Seal unit. The women were a reflection of Israeli society; Ashkenazim, Sephardim, Russians. Each with the ubiquitous cellphone. One day, one of the soldiers played songs for us by her favorite singers: Satchmo and Tony Bennett. Go figure! Comparing them to our kids of similar age was edifying. Lunch is from 11:45 to 1:15. This is the big meal of the day. Salads, choice of hot meat entrée or vegetarian. By this time, the camp is jumping and we are eating with soldiers and staff. We return to work till 3 or 4 p.m., depending on the workload. Supper is at 5:45, and sometimes we have a lecture in the evening. This is our routine. Once a week, they plan an outing and we are bused to some site of interest. Sar-el, which is an acronym for “service to Israel,” was conceived by General Aharon Davidi in 1983 when there was a need for laborers to bring in the crops as the soldiers were away fighting. Through his contacts in the United States, he managed to get 600 volunteers. Since that time, more than 50,000 people, of which 35 percent are Christian and 65 percent Jewish, have volunteered. About 3,500 from 60 countries come each year. Originally, the age limits were 18 to 65, but when the general himself reached 65, he removed the upper limit. The oldest of our group was 92. People come for an average of two to three weeks; some for months. Of our group, only two were first timers. One was returning for his 100th time. I was a relative neophyte: this was my third time. The feeling of being able to contribute to Israel in a meaningful way, and not just financially, is a strong magnet. I know this because I interview those volunteers that come from the West Coast and many of them contact me upon their return to share their thoughts. Gerald Lecovin is a longtime resident of Vancouver, and has been active in community affairs. For the last 14 years, he has been Sar-el’s representative on the West Coast.